Japanese architect Tadao Ando has concealed a huge stone statue of the buddha within a hill covered in lavender plants at the Makomanai Takino Cemetery in Sapporo. The top of the statue's head just crests through a circular well at the centre of the verdant mound, which is carpeted in 150,000 of the purple-flowering plants. Visitors must pass through a 40-metre tunnel to get to the foot of the 13.5-metre-tall statue. Made up of arches of folded concrete, the tunnel is dimly lit to create a "womb-like" atmosphere, while the opening at the centre is naturally lit and surrounded by concertinaed concrete walls that narrow towards the sky. Ando completed the Hill of the Buddha at the Makomanai Takino Cemetery in northern Japan in late 2015, but photographs and aerial drone footage of the project have just begun to circulate. "The aim of this project was to build a prayer hall that would enhance the attractiveness of a stone buddha sculpted 15 years ago. 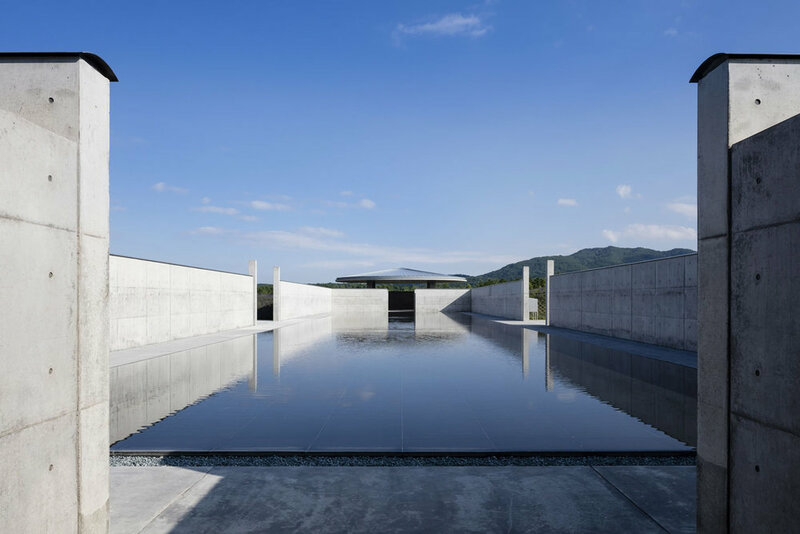 The site is a gently sloping hill on 180 hectares of lush land belonging to a cemetery," Ando wrote in an essay for Domus magazine. "Until now, the buddha statue has stood alone in the field, giving an unrestful impression. The client wanted to give visitors a more serene appreciation of the buddha," he continued. "Our idea was to cover the buddha below the head with a hill of lavender plants. We called the idea the 'head-out buddha'." The vegetation provides a seasonally appropriate backdrop for the statue, changing from green in spring to purple in summer and finally white in winter, when the mound is heaped in snow. A water garden at the base of the mound is surrounded by tall cast-concrete walls and a small border of grey gravel. "One of the cemetery's charms is how well it achieves harmony with the natural landscape," said the Makomanai Takino Cemetery. "Surprisingly, one only sees the head of the statue surrounded by the landscape of the hill," it continued. "Atama Daibutsu (The Buddha's Head) was named for its novel, impressive appearance. It stands in perfect harmony with the surrounding landscape in all seasons. Thus a new symbol of the cemetery been established." "The whole body of the Atama Daibutsu can't be seen from outside. Snow accumulates on its head in winter. What remains hidden from view sparks the creativity," added Ando. A self-taught architect, Ando has become one of the most renowned in his field, winning the Pritzker Prize in 1995, the RIBA Royal Gold Medal in 1997 and AIA Gold Medal in 2002. Many of Ando's recently completed projects have been in Mexico, including a concrete house and art centre for a picturesque seaside site, and a school of art, design and architecture at the University of Monterrey. This project exhibits some of the key characteristics of Ando's work – namely the use of raw concrete, dramatic play of natural light, and the interplay of interior and exterior spaces.